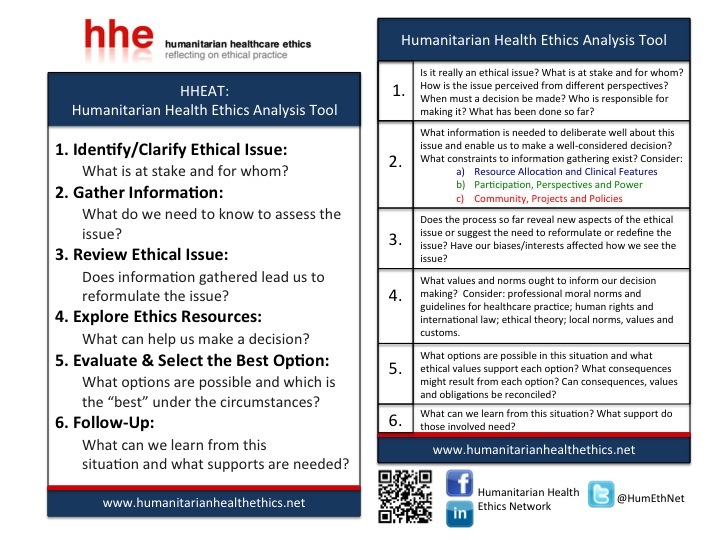 HHEAT is an ethical analysis tool designed to help humanitarian healthcare workers make ethical decisions. This tool can be used in pre-departure training to work through common cases and scenarios, in the field when ethical issues arise, or in debriefing sessions after particularly difficult decisions. Humanitarian healthcare workers are trusted to provide support and assistance to vulnerable groups and populations. This relationship means that humanitarians have a responsibility towards those to whom they provide care and assistance, and an obligation to consider how and why they make choices. The Humanitarian Health Ethics Analysis Tool (HHEAT) was designed to provide humanitarian workers with a readily accessible, action-oriented resource to help guide ethical decision-making. The HHEAT was inspired by stories told by humanitarian healthcare workers about the ethical challenges they had experienced in the field. The tool responds to some of the key themes emerging from these narratives and draws attention to ethical features of humanitarian aid contexts. The aim of ethical deliberation is not necessarily to claim that there is one ‘right’ answer to many vexing ethical issues, but to enrich discussion of what makes something right or wrong by considering multiple perspectives and justifying why you (and/or your team) decide to take one course of action over another. Moral justification is an important part of assuming moral responsibility and accountability, both of which are essential to humanitarianism. The HHEAT, combined with a variety of other approaches, such as: international and human rights law, professional moral norms, humanitarian policy guidelines, and ethical theory, amongst others, can help foster a more comprehensive and systematic approach to ethical analysis and help generate recommendations. Quick reference card highlighting key questions for consideration of ethical issues. Available in English, French and Spanish. Handbook providing a detailed overview of the HHEAT, including explanations of the decision-making process. Worksheet outlining key elements of the decision-making processes and providing space for recording the deliberative process. Funding for this project was provided by the Canadian Institutes of Health Research (CIHR). Graphic design was supported by the Centre for Interdisciplinary Research in Rehabilitation of Greater Montreal (CRIR). The authors are grateful for the input and assistance of Nancy Johnson, Renaud Boulanger, Cathy Tansey, Anne Hudon; for the graphic design by Paule Samson; and for the research participants who contributed to evaluating the HHEAT. Recommended Citation: Fraser V, Hunt MR, Schwartz L, de Laat S. 2014. 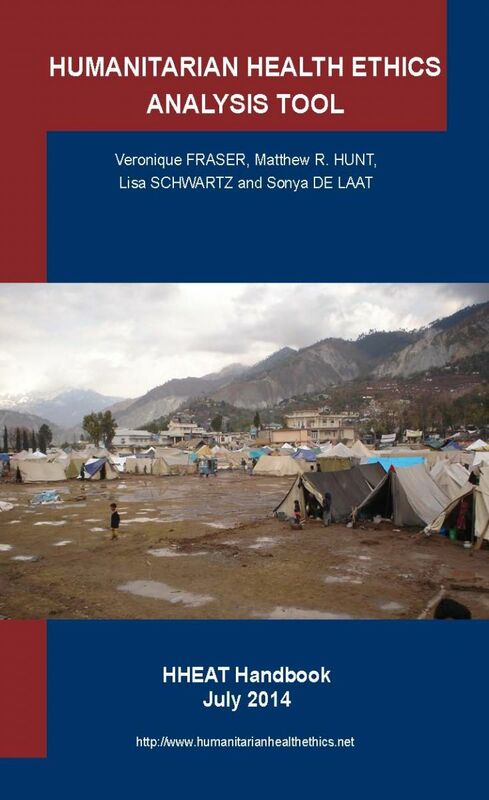 Humanitarian Health Ethics Analysis Tool: HHEAT Handbook. ISBN: 978-0-9938354-0-7. Accessed (date) from www.humanitarianhealthethics.net.